Neural activity influences ongoing remodeling of axonal arbors, a phenomenon that is particularly evident in the development of the retinotectal system of fish and tadpoles. Two papers this week give us a multicolor view of these systems at work. Ruthazer et al. watched the growth of retinal ganglion cells (RGCs) in albino tadpoles, whereas Meyer and Smith used zebrafish. Both authors expressed cytosolic dsRED (discosoma red fluorescent protein) and GFP (green fluorescent protein)-tagged synaptophysin (SYP) in selected RGCs, allowing them to visualize punctate presynaptic vesicles in developing axons. Using time-lapse imaging, Ruthazer et al. report that new branches emerged from SYP-labeled puncta, and more intensely labeled axons were longer-lived. Moreover, branches with mature synapses were more stable, whereas those containing more faintly labeled synapses were more likely to retract. Patterned visual stimulation both stabilized branches containing more vesicles and destabilized branches with fewer. Meyer and Smith also found that new branches formed at SYP puncta and stabilized nascent branches invariably had SYP puncta. The antennal lobe of the adult fly is labeled with the presynaptic marker nc82 (red). 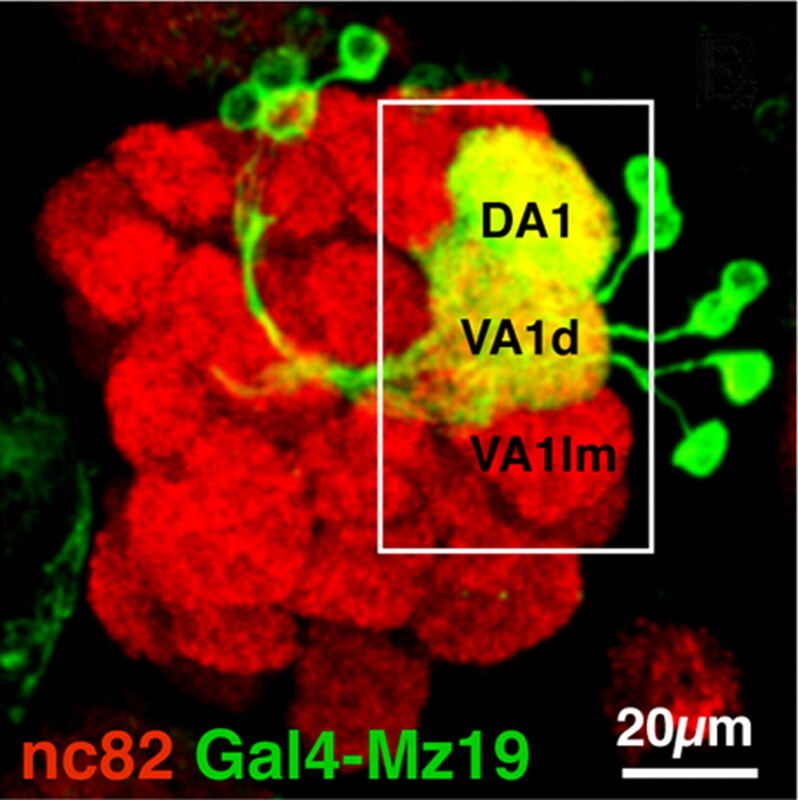 Two of the three glomeruli within the white box are the target of dendrites from six dorsal and seven lateral projection neurons (green) that project to glomeruli VA1d and DA1, respectively. See the article by Berdnik et al. for details. This week, Quian Quiroga et al. address the question of whether posterior parietal cortex (PPC) is involved in intention and/or attention. Previous studies have suggested a role for PPC in motor planning (intention) of tasks such as saccades, reaching or grasping, whereas other studies have interpreted the visual sensitivity of PPC neurons as an indication of a role in attention to the target location. The authors took a single neuron, single trial approach to the problem, asking whether they could predict the locus of attention and/or different movement plans based on the activity of a PPC neuron. Two monkeys were studied in interleaved delayed reach and saccade trials. Prediction of movement plans was better than predictions of target location. Different region of PPC were also better predictors of certain movements, e.g. parietal reach region for reaches and lateral intraparietal region for saccades. Advantage: intention. In this week's Journal, Nakai et al. delineate the role of Rac, a Rho family member, in interactions between axons and schwannoma cells. Schwannomas are benign tumors made up of abnormal Schwann cells that fail to myelinate peripheral axons and often bear a mutation in the neurofibromatosis type 2 (NF2) gene. NF2 normally suppresses signaling by Rho family GTPase that regulate actin cytoskeleton dynamics. Rac expression is increased in schwannoma cells, suggesting a possible role in their failure to respond to neuronal contact. The authors monitored Rac activity using fluorescence resonance energy transfer of a fusion protein made of Rac1 and its effector P21-activated kinase (PAK). Cultured schwannoma cells continuously displayed high Rac activity at ruffling edges, whereas in normal Schwann cells contact with neuritis silenced Rac. Incubation with a Rac-specific inhibitor suppressed membrane ruffling and allowed schwannoma cells to elongate and interact with neurons similar to normal Schwann cells.